Spring is here and with it comes warmer temperatures asking for adaptation in our grooming techniques. Our experts must be vigilant and the grooming plans are adapted daily according to climatic conditions and weather forecasts. As of today, this winter’s important snow accumulation is bearing good news for the end of the season. Snow conditions are excellent. Of course, rising temperatures during the day is an important factor that affects our grooming capabilities. Grooming machines have much less traction on water-filled snow and operators are forced to reduce their speed, thus making it difficult and sometimes impossible to push the snow back up and cover the same number of trails every day. Priority goes to beginner trails, which are worked at the end of the night, as close to mountain reopening as possible, so the surface doesn’t have time to harden as much. As conventional machines do not have enough traction to groom the steepest trails, we have to use winches to work their surface. It is thus possible that some expert level trails are not groomed daily. As temperatures rise, these trails turn into mogul runs that please many spring skiing adepts. We may also have to groom a trail beautifully filled with moguls as snow melts and uncovers dirt spots between bumps. The only solution is to flatten the snow to save the trail. If ever we are hit by rain, we must wait until the water drains away before we can start any mechanical work on the surface. 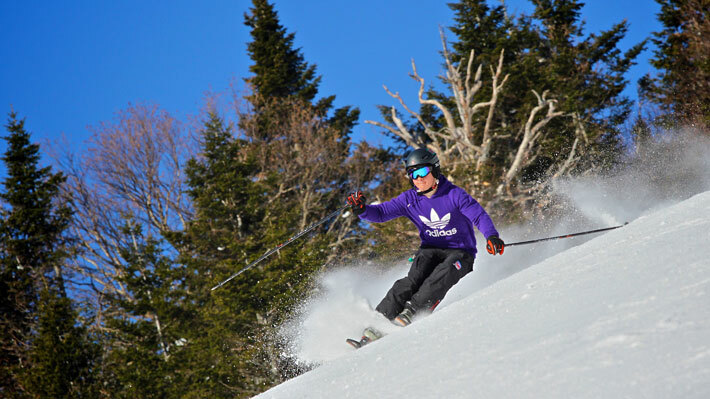 Whatever Mother Nature holds for us, our experts still manage to bring us incredible spring conditions, with 95% of the trails still open at this time! This season, you’ll be able to fully enjoy spring skiing! Take part in one of our spring events, come enjoy our famous après-ski at the foothills and don’t forget your sunglasses and your sun screen! Mountain ops: spring is here! Spring-time grooming: follow the sun!